The Dylan is Dublin’s newest boutique hotel. From the beautifully renovated Victorian facade to the playful, post modern furniture and decor inside, the Dylan has plenty of style. Strong, bold colours and uniquely furnished rooms give the Dylan the flair of a private home rather than a mainstream hotel. Word about this stylish city retreat is spreading fast and the Dylan was voted Best Boutique Hotel 2008 by Hospitality Ireland. The Dylan is situated on Eastmoreland Place, a quiet residential cul de sac south of the picturesque Grand Canal which separates the city centre from leafy and exclusive Ballsbridge. It is a picturesque 15 minutes’ walk from the hotel to St. Stephen’s Green and Grafton Street during which you will see the architecture change from Victorian to Georgian to modern. Standard double rooms at the Dylan have queen size beds and start from €179.00 per room per night, excluding breakfast. A Luxury Double including breakfast is available from €219.00 per night. Suites start at 299.00 per night, excluding breakfast. 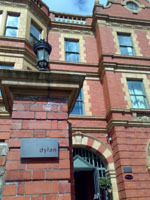 The Dylan has two medium sized meeting rooms, the 1900 Room and the Library. The 1900 Room can accommodate up to 12 delegates in a boardroom or conference setting. The Library is well suited to receptions, product launches and similar events of up to 30-40 guests. Please contact the hotel for room hire rates. All bedrooms and public areas have complimentary WiFi Internet access. The bedrooms are equipped with plasma TVs, iPods and docking stations. The hotel iPods have walking tours of Dublin stored in their memory which makes them ideal companions for a stroll through the city’s historic centre. The Dylan also offers mobile phone and laptop hire to hotel guests. The Dylan Restaurant serves up modern Irish cuisine with focus on seasonal specialities such as game and seafood. The Bar at the Dylan with its polished aluminium bar and stylish outdoor terrace brings a touch of Ibiza nightlife to Dublin. A taxi from Dublin airport will get you to the Dylan in approximately 40 minutes, pending traffic. A single journey will cost you about €30.00. To get around in Dublin, you can take the DART from Grand Canal Quay station, which is a 10 minutes’ walk from the hotel. Upper Baggot Street at the end of Eastmoreland Place is serviced by the 10 and 10A bus routes.